49'3" by 38'2" by 9'7"
One 850 hp (634 kW) Kawasaki Ha-9-IIb 12-cylinder vee liquid-cooled engine driving a three-bladed variable-pitch propeller. 8 prototypes and 846 production aircraft by May 1940 by Kawasaki Kokuki Kogyo K.K. 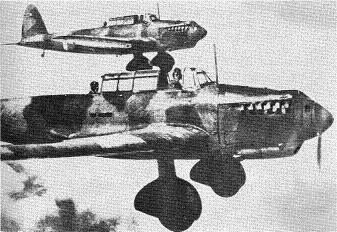 The Kawasaki Ki-32 (Army Type 98 Single-engined Light Bomber) was the Japanese Army’s primary light bomber from 1938 to 1940, having demonstrated better flying characteristics than the rival Ki-30, and it was produced in larger numbers. The design dated from May 1936, when the Japanese Army instructed Kawasaki to design a replacement for the Ki-3 light bomber, and the first prototype flew in March 1937. There were serious teething difficulties with the liquid-cooled Ha-9 engine, but the Japanese Army was now fully engaged in China and needed all the aircraft it could get, and "Mary" went into production in July 1938. At that time its performance was the equal of its counterparts in the West and helped bring the Japanese Army Air Force into parity with the Western powers. "Mary" was the last Army bomber to use a liquid-cooled engine, which proved vulnerable to battle damage, and its performance was limited somewhat by its fixed undercarriage. Bombs were carried in an internal bay. "Mary's" last major combat action was at Hong Kong in 1941, where fighter opposition and antiaircraft defenses were almost nonexistent. Thereafter it was used for training.